Friday 20th May 2016 - ALOFT and MTV joined forces for a very special Liquid Rain Party featuring exclusive performance by international DJ Jonas Blue, infamous for his Number 1 track 'Fast Car'. 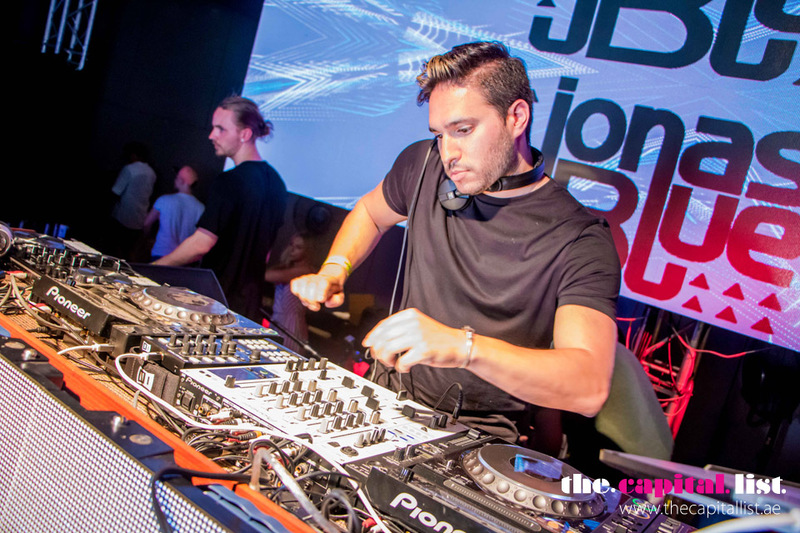 Jonas Blue was joined on the lineup with R3WIRE & Varski, Danny Cee and Aloft resident Lucy Stone. Ahead of his headlining set, we sat down with Jonas Blue to ask him some important questions. Jonas, welcome to Abu Dhabi! You mentioned 'Fast Car' was remixed as your mother used to play it on repeat when you were a child. Will you be remixing any more of her favorites seeing as it was so successful? Actually 'Fast Car' wasn't planned as my first single! I come from a songwriter background, so as a producer doing a cover wasn't ideal but in the end, it worked really well and it's her favourite song so I'm glad I did it. You've played in some incredible countries, Mexico, Ibiza, Switzerland, London, France to name a few, and now here in Abu Dhabi this Friday… which gig has been the most memorable for you and why? I did an American tour a few months ago and had just finished my remix of Birdy - 'Keeping Your Head Up". I was currently in Panama City Beach, Florida for spring break and didn't know what to expect, so I've dropped the Birdy and it was the song of the night, so it was crazy to play the track and see all the Spring breakers going off! Aside from music, what else do you spend your time doing? Nothing. Haha. Music keeps me busy. You've just released a remix of 'Keep Your Head Up' by the British singer Birdy which maintains that uplifting, tropical feel that you are known for. What inspires your sound? I think the tropical sound came at a point where you had EDM but it was such a harsh sound, so whether you want to call it Tropical, there's a lot of really nice music out there now with producers such as Mr Probz - 'Waves' etc... One of my favourite artist at the moment, Calvin Harris, always writes a song rather than a track and that's something I really look for in my music. What's the best part of playing at fashion events and are there any labels which you're hot on this season? The lovely ladies. I was there trying to DJ and just going wow, haha. It's good though, I mean it takes you out of your usual environment which is being a DJ in a club or a festival. It's a really different way of working because for example I was playing at this fashion event in Zurich and there're 6,000 - 7,000 people in the crowd and they're not there to club so you're having to work harder to make them enjoy the night, yeah so it's a different way of thinking and a different way of Djing. Have there been any disasters when you have been performing or touring? Any funny stories to tell us? Ah, yes! There was one really big one actually which was a few weeks ago. I was in Mexico playing to 100,000 people in the Aztekka Stadium, which was amazing and it was pouring down with rain and all of a sudden all the power and music went off. And it ended up cutting out 3 times during my set so my manager said to leave the stage and then they reintroduced me but they had to do it 3 times, so it was really embarrassing! Will you be working with Dakota again in the near future? She's amazing. She's just been signed by Virgin so she's working on her album at the moment but I'll be doing a guest production. What can the lovely people of Abu Dhabi expect from your show at Aloft on Friday 20th May? Lots of energy. Not only with the music I play but I'll be looking around making sure everyone is having a good time. And again, my sets aren't that harsh sounding EDM, you know I love a good song so there'll definitely be lots of songs in there, just really happy, melodic, club house! MTV feat. Jonas Blue performed live at Aloft Hotel on Friday 20th May in the first event of a series of collaborative events.